Lomography has announced that its Daguerreotype Achromat 2.9/64 Art lens will now be available in a chrome-plated finish. Up until now, the 64mm f/2.9 lens has only been available in black and brass options. These were designed for users of Canon EF, Nikon F and Pentax K-mount cameras, although the new finish will only be offered to users of the former two. The Daguerreotype Achromat 2.9/64 Art, which began life as a Kickstarter project in 2016, promises "silky soft focus at f/2.9 and crisp sharp shots from f/5.6 onwards". It's based on a 1839 design and, in lieu of a physical aperture ring, is designed to accept Waterhouse aperture plates, which are dropped into a slot on the barrel (pictured below). As with the existing finishes, the lens will also come with a selection of special aperture shapes to help users create unusual bokeh effects, which are also pictured below. According to the company, the lens is handcrafted at a small manufactory in Central China. 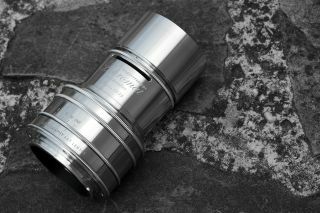 The new chrome finishing is designed to undergo heavy usage, and protect the lens from wear and tear. Scroll down to see some sample images from the new lens. For more details, head over to the microsite Lomography has put together for the new optic.